Lenovo recently announced a slew of new ThinkPads that are said to have Intel’s latest third-generation Core processors, including a ThinkPad ultrabook that Lenovo is touting as the “thinnest ultrabook in the world”. Known as the ThinkPad X1 Carbon ultrabook, this device has a 14″ screen, weighs less than 3.9lbs and is only 0.74in thick. In addition to that, the X1 Carbon will come with Intel’s Ivy Bridge processor. Lenovo has also updated the ThinkPad T-series and X-series devices, increasing their speed and battery life. Also added to the devices are new connectivity and multimedia capabilities that could be very useful for business users. These laptops are said to be available on June 5, 2012. Lenovo has added 4G broadband connectivity to all ThinkPads for the very first time, including the new X1 Carbon ultrabook. At first the service will only be available in the United States and a handful of other countries for a starting price of $1.99 for 30 minutes. Lenovo is partnering with telecom carriers across the world to make the service available to ThinkPad customers. Unfortunately, Lenovo didn’t release any information on pricing for the X1 Carbon though the company did say that it would become available in the coming months. 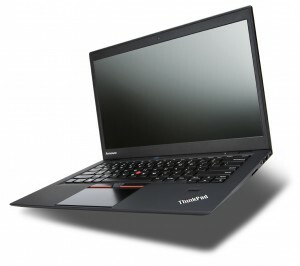 If the pricing is anywhere near the company’s current ThinkPad T430U ultrabook, you can expect a price around $849. Other things Lenovo is offering include a docking station that will have 5 USB 3.0 ports, always-on mobile charging and multiple video-out ports. Like the ThinkPad X1 Carbon ultrabook, pricing on the new docking station was also not released by Lenovo. Thinner seems to be the way things are headed with multiple companies trying to outdo each other on the ultrabook front. Many analysts and professionals believe that the ultrabook market is a bust and that the technology won’t catch on. They also believe that ultrabooks won’t become nearly as popular as Apple’s MacBooks, which was the main reason for their creation. Regardless, companies still see hope in the future of ultrabooks.